We will consider that you have decided to follow a transverse method – so to the opposite of what the Case in Point offers –to crack the consulting cases. Transverse methods, like the one I present in the CCR training, can handle all types of consulting cases during an interview in strategy and management consulting firms. What is the strength of this type of method? It is precisely that it applies in all contexts. What makes it weak? The ramp-up time is longer than with framework approaches, which are mechanicals. To show competence on a transverse method, it is necessary to go through a process of gradual acquisition of skills in each of the differentiation levers that make the method. That is why I have set up various case types: real cases, training cases, written cases, graphics cases, computational cases, cases encompassing a broad spectrum, or extremely limited cases in their thematic, cases where the interviewer leads the way vs. where you take the lead, etc. During training with each type of case, the candidate can improve on key dimensions that form the transverse approach. After working on a dozen or fifteen cases it is necessary to finalize your preparation. For this there is a method that works extremely well and uses precisely the Case in Point. Beyond the methodology presented in this book, its author Marc Cosentino, offers dozens of cases which have the advantage to be firstly highly varied, but also to become the classics of the genre. To finalize your preparation there is nothing better than to review the classics. So here’s the process that I propose to achieve the level of competitiveness required in the best consulting firms. This is to train on a dozen cases in the first instance and supplement if you need it. This work is to be performed once you’ve followed strong training to prepare for the interviews. What follows is in some ways your complementary work to provide. Take a case at random from the Case in Point book: read its statement and apply, to the letter, the process shared in the Consulting Case Revolution method. So you just train alone on the case here. You build your analytical structure in the first, second, or even the third level of details, as defined in the Consulting Case Revolution. You list all the issues that you think are relevant to handle the case. You compare the scope of your analysis to that of the proposed solution in the Case in Point book. You are competitive when the structure you propose includes the specific one proposed by the Case in Point book. As long as your structure is incomplete, this means you need to continue and to train again on a new case of the Case in Point. 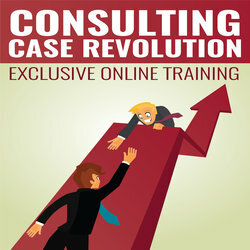 Typically, a dozen cases should be more than enough if you followed the Consulting Case Revolution.